← National Guard Goes Hungry on the Border? Y’all be safe out there. And bring me a plate! Greg Abbott will not debate Wendy Davis blaming the rules to which he agreed to debate. Rules? Really? I’m thinking his internal polls are telling him something and he’s really chickening out. I mean, have you seen his policy pronouncements? He blames Obama for everything and fails to give one iota of an idea on anything. He doesn’t want to tell Texans how he really feels about the issues that matter to Texans because if people really knew how he felt, he’d set them off. And he certainly can’t send his campaign mouthpiece to speak for him–or his madrina. Debate, Gallina! Update: The debate is back on? Runnin’ around like a chicken with its head cut off now. Can’t A Right-Wing Militia Zealot Catch a Break? A US Border Patrol agent fired his weapon at a militia member, according to the DMN. The agent was trying to detain some migrants and the militia nut got in the way. The nut wasn’t hurt and the migrants continued on their way because the armed nut caused the agent to lose focus of his job. I don’t know what outcome makes me happier. No…yes, I do. 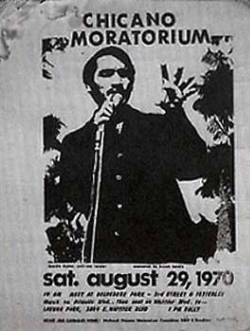 Remember the Chicano Moratorium! 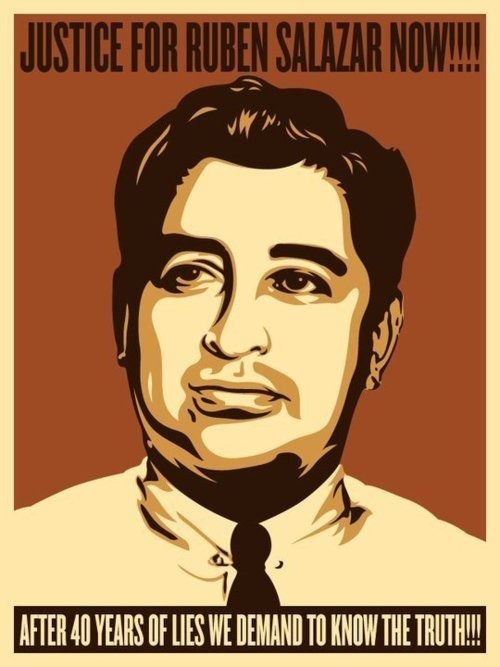 Y Que Viva Ruben Salazar! This entry was posted in Thoughts on Viernes and tagged chicano moratorium, gallina greg abbott, militia shot at, thoughts on viernes. Bookmark the permalink.